As documented elsewhere, I did significant work to my VHF aerial system last year consisting of a new rotator, cable and masthead preamplifier. This has been all very good and has given me a half decent VHF aerial system but it’s also shown weaknesses. My location isn’t great for VHF, the aerial would benefit from being much higher but I don’t think I’m too bothered about doing that. It would have to be significantly higher and much larger to make much difference and I don’t want to do that, I’d rather put up a better HF aerial. Currently I have a pair of 24″ standoff brackets with a heavy duty aluminium pole that’s around 18 foot long. At the top of that are a pair of mounting brackets to hold the rotator at the side of the pole with a five foot stub mast partly overlapped with the main pole. You can see it on my page at qrz.com. I’ve used Kevlar guy ropes which I was recommended to use but having had them in place for a year, I now think they’re terrible! They snap on a regular basis and although I’ve done the best I can to replace them and keep the tension correct, they just keep breaking. When the wind blows, my mast now moves horribly and makes creaking noises that keep my family awake at night. I’m fully aware of the saying “if a radio amateur sleeps at night then his aerials aren’t high enough”. I sleep so therefore I need to make changes and get the aerial higher! So I’ve been looking around for an alternative solution and I think I’ve found one. 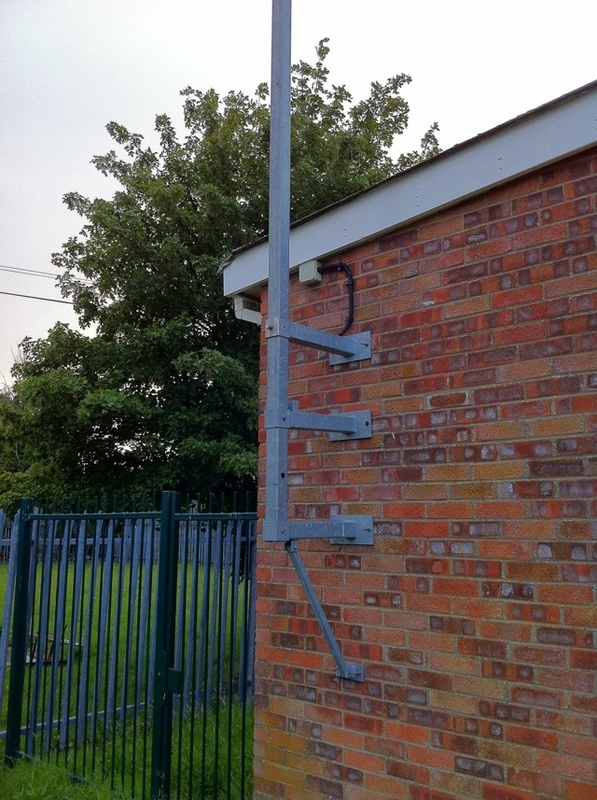 That’s a mast used for CCTV and lighting systems. The mast is nearly three inches square and I’d aim to get one either 6 or 7 metres long. Add a rotator cage and stub mast to the top and it’s a support which will be longer than I have at the moment and I’m advised that it will be very stable and won’t move about in the wind. It won’t come cheap but it’s the sort of aerial mast that will last for years and years and should support anything I care to nail on the top of it. As for what’s going on top – I’ve picked up a Cushcraft MA5B mini beam which is second hand but has never been used and so I want to get that up. It’s one made before MFJ acquired Cushcraft so it should be a good one and I’m looking forward to being able to do this work.